Please contact us with the contact form to report difficulties, strange behaviors or persistent problems, and quote the program name or the number 19586 . Innovative Project Management software that simplifies planning for project managers and facilitates execution for team members. This is the download page for Comindware Project - Comindware Project is a professional Project Management solution for Project Managers and team members that brings an innovative technology for efficient project planning, execution and collaboration. It is designed for mid to large businesses including IT, Marketing, software development and other. Comindware Project allows users to significantly reduce planning time and minimize planning errors thru end-to-end process automation and an intuitive user interface, while enhanced resource allocation and leveling mechanisms allow companies to maximize resource and asset utilization. 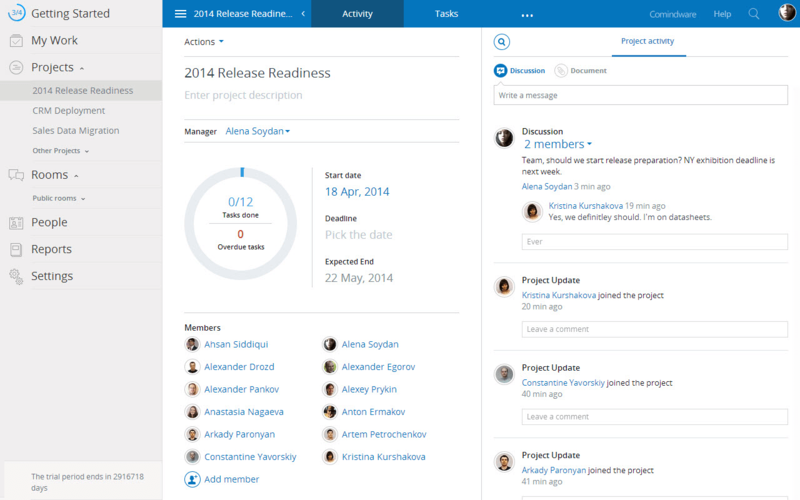 The project plan in Comindware Project is scheduled just by assigning tasks and defining priorities through a simple drag-and-drop interface. Comindware Project allows users to create a fully visual project chart a Work Breakdown Structure and get a clear project task hierarchy with an unlimited number of task levels. The Predictive Gantt chart automatically reschedules the remainder of the work so that the overall plan constantly remains up-to-date and renders the real project status as well as actual estimated milestones and the completion date. Finally, Comindware Project allows users to prevent resource conflicts in advance by allocating resources to different projects based on the distributed workload information. Comindware Project is available in Cloud as well as on-premise. The Solution is also available on mobile platforms; the recently released iPad version provides Project Managers with a complete project planning functionality available now on touch devices. Comindware Project integration with MS Outlook allows users to manage project activities and documents without leaving the familiar working environment.